Eclipses are events that happen when one planet or moon is lined up between a star and another planet or moon. For example, you will see an eclipse when the Earth passes directly between our Sun and the Moon. An eclipse could also happen on the surface of Mars when one of Mars' moons passes between the surface and the Sun. It's all about blocking light and creating a shadow. As the objects move, the shadow moves across the surface planet or moon. Eclipses don't last longer than a few hours because both planets or moons are moving. The amount of eclipse is also dependent on your location. The same eclipse might be a total eclipse for someone in Brazil, but only a partial eclipse for someone in Florida. We've been talking about planets passing between the Sun and another object. 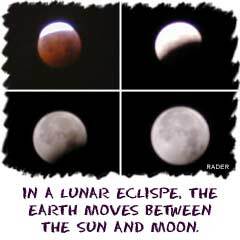 A lunar eclipse happens when the Earth passes between the Sun and the Moon. Lunar eclipses can only happen when there is a full moon. As the Moon's orbit takes it behind the Earth, a shadow crosses the face of the full Moon. The shadow does not always cover the entire Moon in a total eclipse. There are also partial and penumbral lunar eclipses. There are two or three lunar eclipses each year. The best pictures come from a total lunar eclipse. If you hear about a lunar eclipse, feel free to look up. They are safe to look at. Solar eclipses are more spectacular than lunar eclipses, but much more dangerous for your eyes. Never look directly at a solar eclipse (or the Sun for that matter). 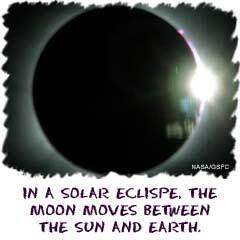 Solar eclipses happen when the Moon passes between the Sun and the Earth. The Moon casts a shadow over a portion of the planet, leaving that area in darkness. If you were watching from space, you could see the shadow pass over the surface. You would also notice that the Moon's shadow only covers a part of the planet because the Earth is much larger than the Moon. A lunar eclipse can put the entire surface of the Moon in darkness. There are one or two solar eclipses each year. The shadow moves across different areas of the planet. Depending on the location of the Moon, there are total and annular eclipses. A total solar eclipse happens when the Moon blocks the entire Sun. An annular eclipse only covers some of the Sun. A little ring of the Sun can be seen around the Moon. There are different eclipses because the Moon can be closer or further away from the surface of the Earth. Eclipses don't always happen on the surface of planets and moons. Spacecraft can find themselves in shadows many times during a mission. The space shuttle often flies in the shadow of the Earth throughout its mission. Technically, the Earth is eclipsing the Sun for the shuttle. A spacecraft orbiting another planet can also be involved in an eclipse. The Cassini spacecraft orbiting Saturn has aligned itself several times when two moons are obscuring each other. The image shows Saturn in the background, one full moon, and another moon that only displays a crescent shape. It's all about being the right place at the right time. We've already mentioned that eclipses happen on other planets. The Mars Exploration Rovers have photographed eclipses from the surface of Mars when the Martian moons pass between the Sun and the planet. Since the moons are very small, a small shadow passes across the surface.